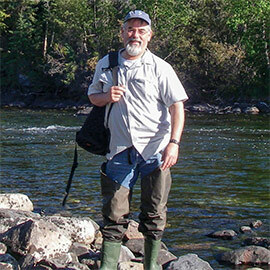 For Jim McGeer, a professor of biology at Wilfrid Laurier University, an associate director of the Laurier Institute for Water Science (LIWS) and a Canadian Rivers Institute (CRI) associate, research projects “are all about water and sustainable environment.” Much of McGeer’s work has involved inorganic contaminants, their impact on sensitive aquatic organisms and how environmental factors within ecosystems and watersheds influence responses. McGeer’s work involves not only the basic research associated with contaminant impacts but also the development of that information into environmental policy. He works with Environment and Climate Change Canada, the Ontario Ministry of Environment and Climate Change and the Environment and Natural Resources Department of the Government of the Northwest Territories. Through these collaborations with governments as well as industry, his students gain an appreciation of the application of science in environmental protection. By its nature, the research is interdisciplinary and students working in his lab also develop understandings of physiology, toxicology, geochemistry, modelling and risk assessment. McGeer values his role as a mentor and the importance of helping students to develop the skills that will make them successful in their careers. In his lab, he looks for hard-working researchers with an interest in developing solutions to environmental issues. He takes on projects ranging from basic scientific understandings to solution-based projects for application in risk assessment and regulations. McGeer has been associated with LIWS since its inauguration. It is a multi-disciplinary, collaborative undertaking among research faculty from numerous departments across the university. The institute is housed in Laurier’s Centre for Cold Regions and Water Science, which McGeer describes as a “communal space designed to bring people together and foster collaboration." The LIWS research focuses on three interconnected water-related disciplines: hydrological sciences, ecology and biogeochemistry, and public policy and management. It has focused on both Canadian and global water issues, including the effects of climate change, the sustainability of healthy aquatic and coastal ecosystems, and the development of regulations and policy related to water use.